Farmers markets supply fresh, locally grown produce around the county, usually on Saturdays, although there are also Wednesday and Thursday afternoon markets. Most are open only from late spring through early fall, but one market in McMinnville operates year-round. Offerings may include fresh vegetables, fruit, flowers, honey and vegetable starts. Depending on the market, there may also be locally-grown flour, locally-made bread, pastries, jams, eggs, meat, cheese, fresh or dried herbs, specialty food products, and a variety of crafts. There may be live music, or food vendors, providing a festival-like atmosphere. Not every vendor accepts credit cards; it's best to bring cash. Some are able to deal with food stamps. Although some booths may provide plastic bags, it's common for people to bring their own totes or baskets. Don't hesitate to inquire about bulk purchases for preserving; they may be available. The Farmers Market at the Grange in McMinnville is open from 10 a.m. to 3 p.m. Saturdays, year-round. It is located at the historic Grange Hall, 1700 S.W. Old Sheridan Road. Vendors sell organically-grown produce, honey, frozen fruit, wool, meat, chocolate, skin creams, clothing, jewelry and crafts. Live music is provided and fresh bakery products also are available. 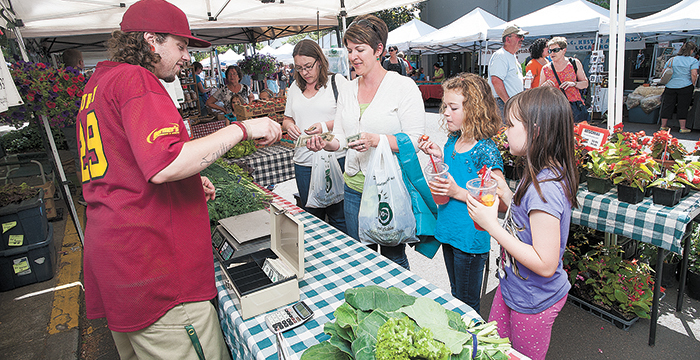 The popular McMinnville Thursday Farmers Market is open from 1 to 6 p.m. on Thursdays. It will begin May 21 this year, and run through Oct. 8. Vendors supply a variety of produce, plants, meats, cut flowers and crafts. There is live music and wine tasting. It is held on Cowls Street between Second and Third streets in downtown McMinnville. The Granary District welcomed a new Saturday market last year, open year-round from 9 a.m. to 4 p.m. Saturdays, near the corner of Alpine and Eighth streets. The Newberg Farmers Market is located in downtown Newberg from 1:30 to 6 p.m. Wednesdays, from the last of May through the end of September. It is in the Cultural District Pavilion, behind the Newberg Public Library, on Sheridan Street. Previously, the market operated on Tuesdays. The Willamina Farmers Market will be open Saturdays from 9 a.m. to 1 p.m., June 27 through Oct. 3, in a new location, on C Street, next to Center Market.